I don't really have many uses for a conventional word processor because I create documents mainly using Xemacs, LaTeX and Mathematica (these links have some background information on the creators of TeX and Mathematica), and LyX. But occasionally people send me documents in Microsoft Word format, and by now I have only one computer left in my group that actually has Word (or any Office program) installed. So the problem is: how to render Word .doc files useful if they come your way relatively infrequently. 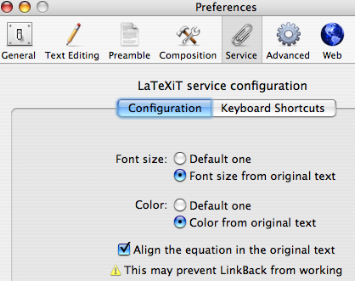 If you're interested specifically in how to convert from Word to LaTeX, have a look at the Word → LaTeX page. Of course, one should also ask: If we want to get rid of MS Word, what do we replace it with? There is no simple answer, but in an science-and-engineering environment one possible answer would be: any of a variety of editors that support LaTeX. If you want to find out more about that, there's a separate page dedicated to converting from MS Word to LaTeX format. On this page, the original motivation is the somewhat more general task of converting from Word to something else, just as long as it's not Word. As a by-product, I also raise the question of how to convert from HTML to something else. This is discussed from a Mac-OS X specific point of view, and therefore programs like Pages and TextEdit play a role. Shouldn't this read "what are pages?" No, I'm referring to a word processor and layout program named Pages which is sold by Apple as part of the iWork bundle. This is not an in-depth review, more an aside to my remarks on Keynote and on LaTeX. If you have to collaborate with MS-Word users, Pages may be a good solution because it supports not only the MS file format but also the important collaboration feature of change tracking. On UNIX platforms such as Mac OS X, the change tracking feature for text files is achieved using the ci, co -l and rcsdiff commands of the Revision Control System (RCS), see e.g. man rcsintro, but that's of course a solution which can't be applied with Word users. Before describing ways of importing "foregin" formats using Pages, I'll try to give it some credit based on what it can do on its own. Ease of use is a big plus with Pages, and for short documents that are designed to be printed or emailed quickly, this application is a good choice. 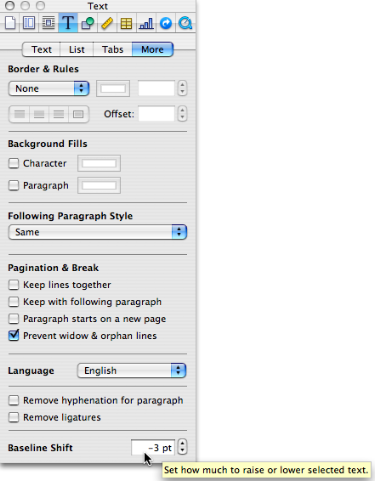 You can do similar small tasks with Word, but Pages has the big advantage that it is well-integrated with Mac OS X. Consider the following as an example only. As of summer 2018, Pages supports mathematical typesetting natively — you can choose between LaTeX or MathML code to enter equations. To find out exactly what subsets of these languages are supported, consult the Apple support pages. Now the equation will automatically flow with the text paragraphs if I decide to, e.g., insert or delete material above the formula. If I don't like the size of this formula, I can drag it to scale it as large as I like. This works because the inset equation is actually a PDF vector graphic. The ability of math insets to flow with the text is very important, and Pages combines this with the full power of LaTeX by using the LaTeXiT Service. Manually fine-tune the alignment by highlighting the equation and then opening the Inspector to display the tab shown in the screenshot on the right. At the bottom you'll see the baseline offset box. With the help of Services such as the one illustrated here, an editor (or any other application) can grow almost without limits in terms of capabilities and ease of use. Another possible area where Pages could benefit from Services would be bibliography handling. There is currently no support for that in Pages, and I'm not aware of a Service. However, there is an AppleScript that looks promising, created by Jim Harrison. It works together with BibDesk, a bibtex-based citation manager that no LaTeX user on a Mac should be without (as I already mention on a page from several years ago). The mechanics of writing a service is made easier by ThisService, a helper application that can be used with the programming language of your choice. What if I don't have a TeX/LaTeX installation? Mac OS X (Tiger) comes with a great little Utility called Grapher, which lets you type arbitrary mathematical expressions. There's a symbol palette, but the editor also understands many LaTeX-like shortcuts (e.g., "alpha"... for greek characters, and symbols like "infinity") so that you can make fairly complex equations in a natural way, and with immediate visual feedback. Right click on the equation and select Copy as LaTeX expression. This is useful for importing LaTeX snippets into another LaTeX source file. Right click on the equation, or highlight it and go to the Edit menu, and then select Copy as.... Here you can select, among others, a PDF version of the formula. This can then be pasted into other applications such as Pages. You can achieve the same thing by dragging the formula. Note that you can use Grapher to write mathematical equations even if they are in no way ready to be plotted. The editor built into the program is basically an all-purpose equation editor! TextEdit, which comes with Mac OS X. You can open Word doc and RTF files with TextEdit and often get quite acceptable results. Tables used to be a problem for TextEdit, but this is no longer an issue for TextEdit under Tiger. NeoOffice/Aqua version 2 achieves very good results from those Word documents I have tried (including faithful table layout). This software is continually evolving and has very comprehensive support for file formats across the board from text to graphics. You can copy and paste with other applications; but in terms of inter-operability with other OS X applications, you encounter the same limitations as with MS Office (e.g., no services). Pages is not a general purpose editor or file format wizard. Its import and export capabilities are limited, not unlike those of MS Word. An important format to discuss is HTML. Pages 3 can't import or export HTML files, but does open and export RTF(d) format. This file format allows you to combine Pages with TextEdit. And TextEdit does do a reasonable job at importing and exporting HTML, as I'll describe below. I don't have anything to say about exporting to Word format (Pages has that option), because I never do that. A good review with more in-depth information is found at obviousdiversion.com/. Remember: if you send email to people outside your own immediate work environment, use universally accepted formats like plain text, RTF or PDF (listed by simplicity of the source, and I left out HTML because it runs into problems with spam filters). Pages is a great tool for doing this, but Microsoft word can of course do it, too! Now you're perhaps saying, "yes, Word can do it, but it's a hassle to export in those formats." Common sense will then tell you what a hassle it must be for people who want to import your Word document! TextEdit probably deserves more recognition than I have given it up to now. My son James discovered that he can drag Quicktime movie clips and sounds into a TextEdit document and save those together with the text. These kinds of multimedia features, together with the text-to-speech capabilities, make TextEdit a fun and useful tool. I noticed that TextEdit imports HTML documents rather nicely. In older versions of Pages, HTML import was possible but didn't work very well. Maybe that's why it's no longer even an option in Pages '08. One may call this a loss of functionality in Pages, but I think it's for the better since the old functionality was flawed. Open the resulting rtfd file in Pages. The TextEdit program does a decent job of reading in HTML layouts as well as images. Because of the image inclusion capabilities, this route for reading in HTML documents is better than what you get by directly using older version os Pages, and also better than what textutil does (see below). Given the above state of affairs, one has to wonder why Apple didn't implement my three-step procedure as a menu item in Pages '08. After all, I've had this prescription on this page since August 2006. Wouldn't it be nice if TextEdit became more integrated with Pages? I suspect Apple don't read my web site. Well, maybe they read the warning at the top. If you're having trouble with Word documents in Pages, definitely try TextEdit, too! It's free and small, but surprisingly versatile. This has recently been discovered by Macworld, too. The export options of TextEdit include webarchive and, if the file is formatted text but nothing else, also pure HTML. The webarchive format is used when several files (especially images) have to be bundled together with the web page. This archive is easily expanded back to a HTML file with the requisite files by typing textutil -convert html filename.webarchive in the Terminal (where filename is the name of your archive). More on textutil below. The command line can also be avoided by using WebArchive Extractor, a little application created precisely for this purpose. The result has correct formatting but may not show all the images that were present in the original TextEdit file, if those images were not in a HTML-compatible format. For example, PDF or TIFF files can't be displayed as images by a web browser. Additional post-processing is needed to make the respective images show up on the exported page. With Mac OS 10.4, the trend toward washing out the boundaries between applications and the operating system itself seems to continue. The OS is like a giant repository of functionality, not just the bookkeeper that watches over your files and processes. For the problem of Word document conversion, the Tiger operating system offers a new function called textutil. This is not to be confused with the GNU textutils. textutil is a command-line utility that can convert between a variety of different formats, including Word doc, WordML, HTML and RTF. See my notes on conversion to LaTeX for specific applications of textutil.